Please allow up to 48 hours (not including weekends) for arrival in pdf format. 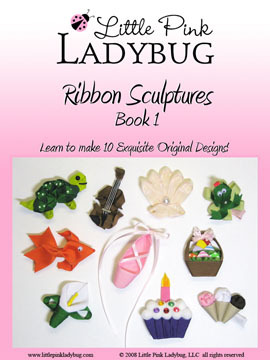 Learn to make 10 exquisite, original designs, originally handcrafted by master ribbon sculptor, Karyn Ranzau. You will have each design carefully broken down step by step to recreate these mini masterpieces for yourself. Hundreds of photos and simple instructions will guide you through this engaging art. Cupcake with candle variation, Ice cream cones, Goldfish, Froggie, Ballet Slipper, Easter Lily, a brand new Seashell, Turtles, a delightful Easter basket filled with eggs and the newest addition, a beautiful Violin. Don't miss out! Make these adorable clippies yourself! 390 clear color photographs and 105 pages. Our new forum here will be available for helping out with questions, details and tips, exclusively for those who purchase instructions. If you ordered from another site, please email your order number and you will be granted access. Please allow up to 48 hours for your book to be emailed. This is an electronic pdf file only. Verify your Paypal email address upon checkout. Ebook will be delivered to the PAYPAL email address to prevent fraud.